Well today, finally--FINALLY--the flexoglass showed up for enclosing our wheelhouse. Flexoglass is a VERY clear plastic sheeting, about 4 mil, that is often used to enclose porches and the like. We'll be using it to turn our wheelhouse into a greenhouse for the winter. New support struts to our solar roof to facilitate the enclosure. Dealing with the weird angles on a sailboat hull can be a challenge. 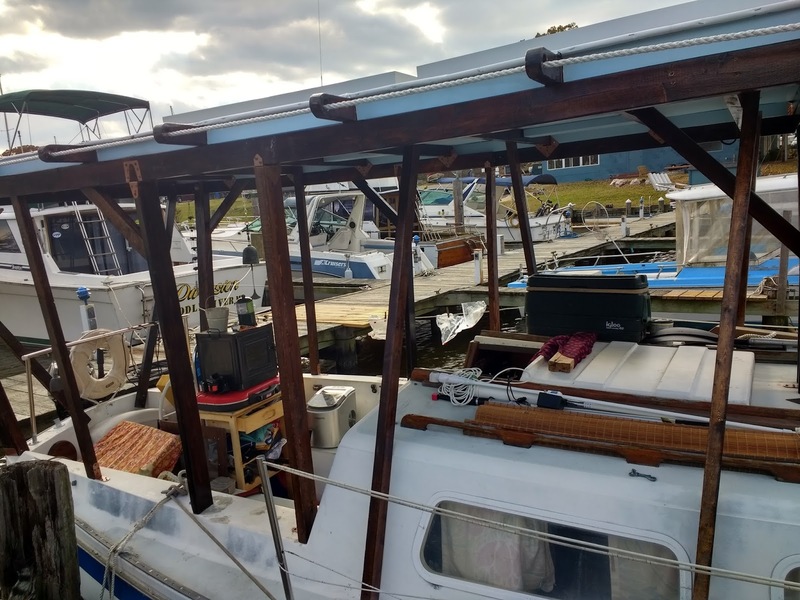 We spent most of the day installing a series of new support struts to which we'll attach our new, clear membrane around the wheelhouse. 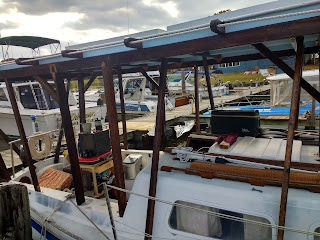 Since this is an old sailboat hull (a cal 2-29 to be specific) some of the angles are, to put it mildly, bizarre. The Flexoglas turned up way too late today for us to do much about it, so that's the agenda tomorrow. Will give you a full report, but, from sitting in the cockpit this afternoon in the sun, the whole concept looks promising. 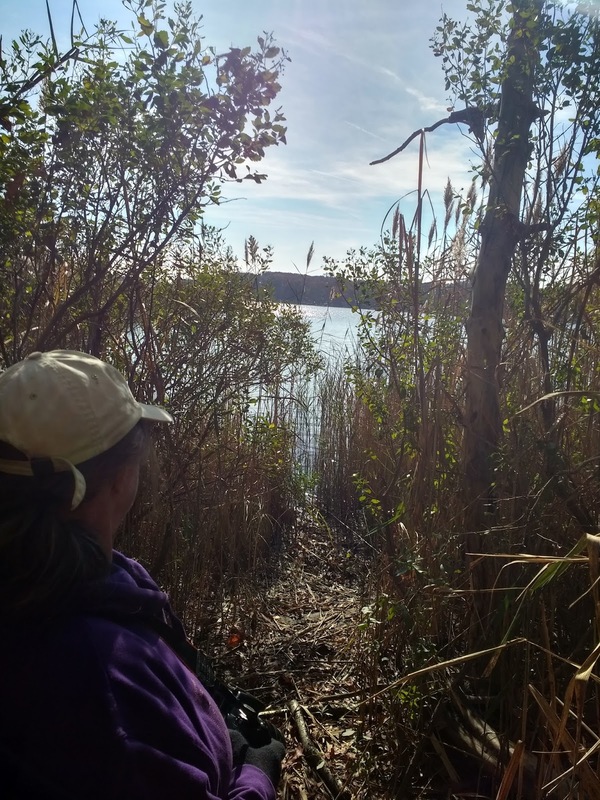 We've finally gotten a bit of cold weather here on the Chesapeake, but the last couple of days have been beautiful, so we took the opportunity to go hiking in one of our favorite spots, Marshy Point Nature Center. 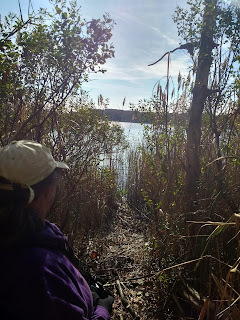 It's really beautiful this time of year, and, frankly, we need to get out of the boat and get some exercise that didn't involve construction. Where ever you are, there is a place like this near you. Take advantage of it. We love Marshy Point. 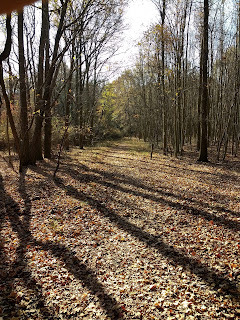 It has a great staff, a cool little interpretive center, and miles of well maintained and marked trails through some of the most varied flora and fauna I've encountered. 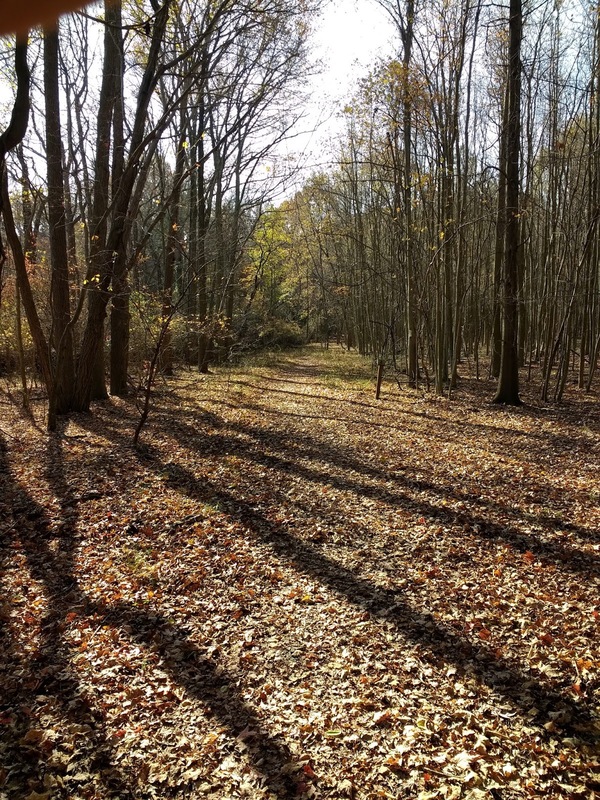 Really a lovely day to do some hiking. This time of year, in particular, the lycopodium stands out. 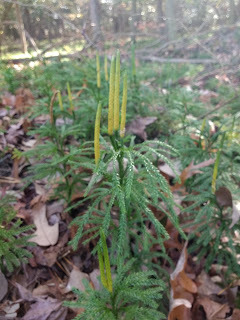 The club moss looks like tiny pine trees. It's cheerful, evergreen, has lots of medicinal uses, and is vaguely explosive. . . .
One of the few explosive plants of which I am acquainted. . . .no kidding about that last one. The spores were used in flashpans for early photography and are still used for magician's flash powder. So tomorrow we begin closing in the wheelhouse, which should make for a MUCH more pleasant winter. Will give you pictures and a description of how we're doing it shortly.